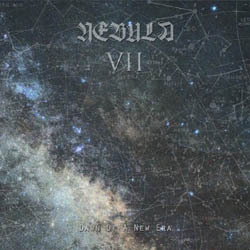 Nebula VII is an experimental drone ambient band from Russia, the solo project of VII, who is also involved in other projects too, like Memories of the Past, D010259 and Static Messiah. Since 2010, Nebula VII have released countless full-length albums, EPs, singles, compilations and splits, most of them in very limited CD-r and tape editions. Their latest full-length album “Dawn of a New Era“, that was released in 2014 by the collaboration of Kadaath Records and Area 51, must be their first work ever that was officially pressed on CD. “Dawn of a New Era” is a more than decent release of this genre and for sure the easiest work of the band to get, if you are interested in physical CDs of course. It comes in a standard jewel-case CD edition of 500 copies with 4-page booklet, co-released via the Russian label Kadaath Records (a Rigorism Production sub-label) and Area 51. If you want to find more info about the band and explore their complete discography, you can visit their official pages below and especially their Bandcamp page, where you can listen to many of their works.